There are several different programs that Elite Sports Performance can offer you. We work with middle school, high school, college, professional and adult athletes. Elite Sports Performance also works with typical “personal training” clients. Although Carter and Brett are strength and conditioning coaches, many of their clients are not “athletes” but enjoy the hard workouts and alternative training that you would find in a professional sports team training facility. A personalized strength and conditioning program where athletes work 3 days a week (Mon, Wed, Fri) with 3-4 other athletes of similar age, ability level and sport. We will typically work on speed, agility and power for 1 hour and complete a full upper and lower body weight program for 30 minutes to 1 hour. 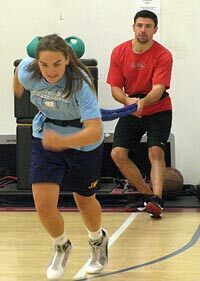 An individualized program where the participant is working one on one with either Brett or Carter. A one on one program can be done 2 or 3 days per week and is designed for a client who has specific demands or goals they want to achieve. A program where a specific team will come in 2-3 days a week and work as a team to improve their speed, power, agility, strength and endurance. With team training they will be the only clients in the facility. Some of the teams that have recently used our services include: Seacoast Spartans Hockey, Winnacunnet Hockey, Portsmouth High School Basketball, St. Thomas Boys Lacrosse, Strafford Stars Girls Basketball, Portsmouth High Football, Portsmouth High Tennis Team, Seacoast Swish Girls Basketball, Portsmouth Volleyball, and Seacoast Rugby.